PRODUCT OF THE YEAR title again this year, for not one but two products. 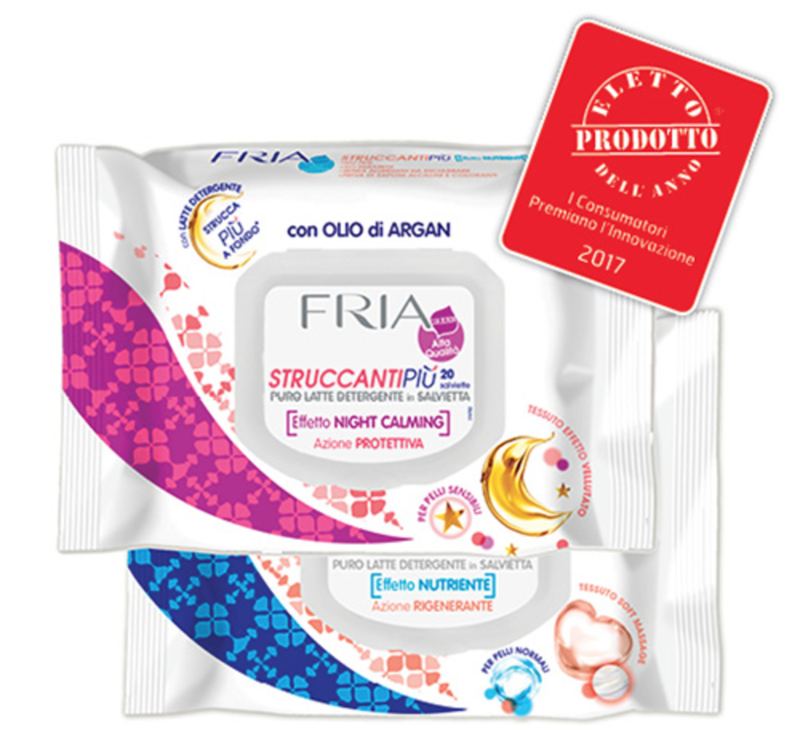 Fria Baby Sensation was chosen in the “Baby Care” category. Le due linee Fria StruccantiPiù con latte detergente were chosen as PRODUCT OF THE YEAR 2017 in the “Make-up Removal Products” category. The awards night for the 12th edition of “Product of the Year”, one of the most important Italian awards for innovation and product satisfaction as well as one of the most recognised among consumers, was held on the 16th of March 2017 in Milan’s Alcatraz venue. With a presence in over 35 countries worldwide, every year it rewards the best products which, in their respective categories, have shown the greatest innovation and levels of satisfaction among their users: the 12 thousand consumers representing the Italian population who voted for them. The entire process is monitored and analysed by IRI. Product of the Year rewards those businesses that have best understood, met, and satisfied consumer needs with an emphasis on innovation in ingredients and materials. More than 12,000 consumers voted for the Products of the Year through the most important market research on innovation in Italy. The Awards Night was held in Milan on the 16th of March 2017 and brought together players and experts from the worlds of industry, marketing, and distribution as well as communications and the press. The awards were received by Alidori Gildo, CEO of Diva International. Research shows that Italian consumers are increasingly changing their purchasing habits: there is growing interest in natural ingredients, organic produce and materials with a lower environmental impact. Diva International can make use of the data revealed by the research and use the Product of the Year 2017 logo for all its forms of communication, including social media, for one year. The PRODUCT OF THE YEAR 2017 logo is a symbol of trust and added value for consumers, as well as focusing attention on the innovative qualities of the product. The consumers who voted for Fria products as PRODUCT OF THE YEAR 2017 reaffirm their trust in and loyalty towards the brand, and in this way they actively support innovation in terms of formulas, fabrics and packaging. Diva International thanks its consumers, its employees and all its commercial Partners for their trust and loyalty. The company will continue to devote great attention to the research and development of its products in the future, with special attention and emphasis on the natural qualities of the ingredients selected for their formulas.